A new study published in Psychopharmacology shows young rats injected with medroxyprogesterone acetate (MPA) performed worse on behavioral memory tests. MPA’s memory impairment persisted even once it had been cleared from the blood. 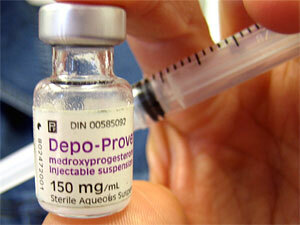 MPA is the active component of the Depo Provera shot but not found in other hormonal contraceptives. The finding is especially significant because it is not true of all estrogens—the senior author found early in her career that estradiol can improve memory at similar tasks. In humans, a case study has been reported of a woman who experienced amnesia and mood changes following MPA treatment. Finally, in a randomized controlled study of over 7,500 women taking hormone replacement therapy reported in JAMA, women receiving Prempro—MPA and premarin (isolated from PREgnant MARes’ urine of horses)—were twice as likely to become diagnosed with dementia compared to those taking Premarin alone. Rats were tested with the water radial-arm maze—a test of working and reference memory, the Morris Water Maze–a test of spatial reference memory, and the visible platform maze—a control task that does not require memory to insure the mice had intact vision and movement. Rats given MPA showed impairments. The most significant findings came from the radial-arm maze showing decreases in working memory and spatial reference memory. For the water radial-arm maze, rats are placed in a chamber with eight arms submerged in water, and the rat will swim until they can find a platform to stand on. On the first trial, four of the hallways contain platforms, once the rat finds a platform, it is removed and the rat is placed back at the start of the maze. Rats are trained in the task and to find the platform quickly they must learn to remember which arms will contain platforms at the start, and also which hallways they have already explored the next trial. All rats given MPA showed significantly more working memory (or short-term memory) errors, by entering into arms they had already entered into earlier in the session. Rats that had given MPA for twice as long of a period showed increased entries into the arms that never contained platforms in any trials showing a deficit in spatial reference memory. Authors of the study looked at MPA’s effect on the GABAergic system, the main inhibitory neurotransmitter system. Using western blot, the researchers found a dose-dependent decrease in they found, the enzyme that synthesizes GABA (GAD) in the dorsal hippocampus, a structure important for memory. Authors speculate that MPA may indirectly modify GABA systems by altering progesterone metabolism, because progesterone’s RingA metabolites bind directly to GABAA receptors. Increased GABAA activation could in turn cause memory problems and homeostatically decrease GABA synthesis, explaining lower levels of GAD. Authors also speculate that the MPA-related memory impairment could be from the halting of ovulation itself. One thing that confuses me about this study is that all rats were ovariectomized, I’m assuming to lower confounds from circulating hormones in the mice. While this makes sense to model menopause for a study of hormone replacement therapy, it may not make the best model of MPA for birth-control use.